The American landscape looked a lot different at the beginning of the 20th century. Aside from obvious technological differences, homes themselves have come a long way, especially in the kitchen. Designs that were popular in kitchens 100 years ago pale in comparison to the modern amenities that make life easier today. Combining simple functionality with traditional designs, 20th century kitchens developed so as to be convenient for housewives and servants. Simple was the operative word in early 20th century kitchens. It was essentially a workroom for the women of the house. Small in size, the kitchen typically featured a sink with a counter on the sides for food preparation or for drying dishes. There was a range, either woodburning or gas-powered, and then there was a table for casual eating. Often, the cabinetry was free standing or consisted of simple shelves, as built-in cabinetry wasn’t too prevalent at this time. The pantry served a central function in any early 20-century kitchen. 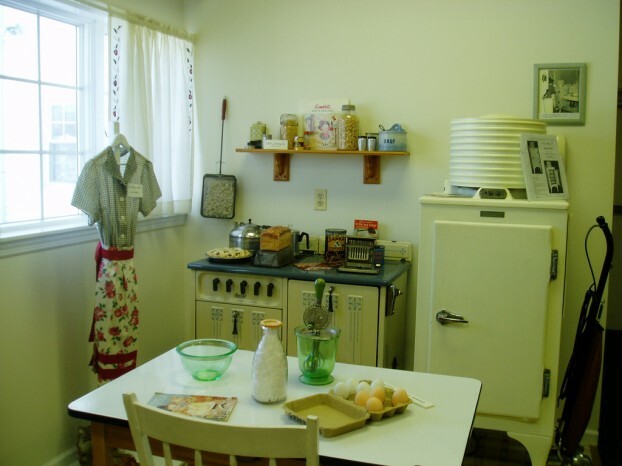 In more affluent households, floor-to-ceiling pantries were installed, allowing the servants and homemaker to utilize additional storage for cooking devices. It was referred to as a pantry dresser and stored pots, pans, and staples. They were considered a fancy addition to a home, adding a bit of decor not seen in standard homes of the middle and lower classes. Pantries in most homes usually comprised a small partition between the actual kitchen and the dining room, often called a butler’s pantry, serving as a transitional space between the bustle of the kitchen and the relaxing atmosphere in the dining room. The pantry may have been used to stock dinnerware and utensils, or it may have also housed canned goods and other mainstays of the kitchen. Although refrigerators weren’t around yet, at least not as affordable purchases for homeowners, kitchens featured iceboxes, made of oak and were sometimes lined with metal or zinc. The icebox could be found on the porch or in a hallway so it was easy to stash milk from the milkman when he came around. After the 1920s, continuous lines of cabinet space built into the walls became more and more common. Coupling the cabinets with complementary countertops also became more common. In terms of design, in the late 19th and early 20th centuries, kitchens featured open floor plans with an emphasis on function over style. Featuring a work table, sink, and a stove on legs, kitchens from 100 years ago lacked decor for the most part, although many had light yellow walls because it was thought that the reflection it gave off made dishes appear more attractive. Countertops were often made of laminate with aluminum edging, which was the affordable choice back then. Little adornment graced the walls in early 20th century kitchens. They either featured wallpaper or a simple basic color such as light blue, pale yellow, or white. Windows, if there were any, would have featured conservative draperies or nothing at all. Furniture, household items, rooms and the houses themselves in early American styles were popular in the early 20th century. Ross Grayson is a freelance home improvement and design blogger based in Everett, Washington. Ross encourages homeowners who are looking to redesign their outdoor kitchen to visit Wood Crafters, a leader in outdoor kitchen design. Image credit goes to greece historical society.